It would be really odd to say that everyone should feel confident in their own skin. My Skin has always been a constant battle that I've had to live with, to the point it was making me miserable and I'm not the only one that's going through the same thing on a daily basis. Makeup is a good way to make ourselves feel beautiful and lovely and our natural beauty is easily forgotten which contain our flaws which all make us unique and individual. However, your skin does not define who we are. The spots on our face doesn't not shout out 'Oh, this girl/guy clearly doesn't look after himself!' Because, that simply isn't the case. 'Urgh, your face looks disgusting!' or 'You have so many spots on your face' is probably the most hurtful comments you can say to someone who suffers from Acne, or any skin condition for that matter. It makes me so angry (and you probably feel the same..) when people are so judgemental over someone's outer beauty as opposed to their inner beauty. Even though I am not a skin expert, having about six years experience of having difficulties with my skin means I'd like to think I can give you some advice on how to embrace the skin you have and not see it as something which is defining who you are. Understand and acknowledge your insecurities. Insecurities are very common and we all have them someway or another. My experience started of when I was 16-years-old, my face appeared with this stubborn Acne that I couldn't seem to get rid off. This year, I decided to seek professional help who made me realise that it is a totally normal skin condition that a lot of people have. My skin has got a lot better now and it has definitely taught me realise that I can accept the redness and spots on my face, which is good as I now don't wear as much makeup. Letting your skin breathe is really important as you get to let your flaws shine through. The more you embrace these flaws the more you will realise that they make you who you are. If people judge you based on your outer beauty, don't give them time to see your beauty within. Unfortunately, people are going to be very rude and judge you on what you look like. Ignore them and concentrate on the people who support you. I've had many compliments saying my skin has got a lot better and have even noticed that I'm wearing less make up now. It's comments like this that lift you up and make you happy. "Beautiful has nothing to do with looks. It's how you as a person and how you make others feel about themselves." Do things that make you feel good. This could be going for a walk, drinking a herbal tea, going for a run or reading a book. Whatever makes you feel beautiful - do it! If you try and do more of the things you love, it will make you feel lovely. Skin is our biggest organ, so it is important to take care of it. However, do what works for you. Everyone has different types of skin so what might work for one person won't work for another. If you don't know how to tackle your skin, seek advice from an expert - they'd be more than happy to help you! This could be a dermatologist or woman at the beauty counter. I've had quite severe Acne over the years so I saw a dermatologist earlier this year - honestly was the best decision I ever made! 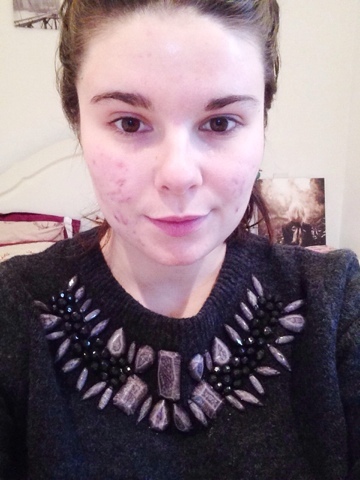 I hosted a #bbloggers chat last week about embracing your skin/skin difficulties. If you have any questions about anything I've said here, don't hesitate to tweet me on @genevieve_tyler. I'll also show you the questions incase you missed it!